Profiles of just some of the remarkable female students, volunteers, staff and alumnae connected with Middlesex including Dr Bianca Stumbitz, Professor Sonia Boyce and Iwona Blazwick are featured here to mark this annual day. From students to academics and from staff to volunteers, all these women help to make Middlesex a diverse, forward-thinking and global educational hub. 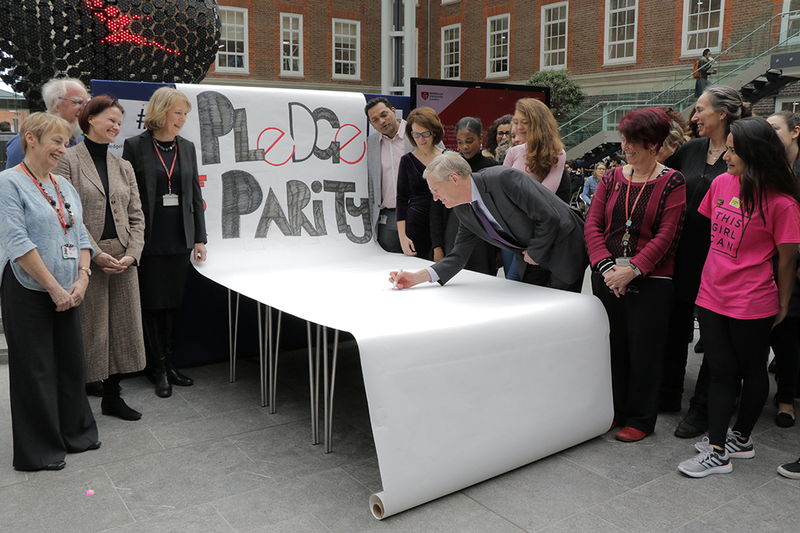 In the Rickett Quadrangle, Vice-Chancellor Tim Blackman became the first to sign our pledge for parity on International Women's Day, followed by senior school representatives and students. All staff and students are encouraged to add their signatures to the canvas to show their support. #PledgeForParity is the campaign theme for International Women’s Day 2016 and people across the world are being encouraged to pledge to take a concrete step to help achieve gender parity more quickly. Pledgers can commit to help women and girls achieve their ambitions, call for gender-balanced leadership, respect and value difference, develop more inclusive and flexible cultures or root out workplace bias. You can make a pledge for parity on www.internationalwomensday.com and support the campaign on social media using the hashtag #PledgeForParity.